Change is good but normalcy is even better. The change in this case is the Indian car buyer's infatuation with diesel. And we can relate to it well; after all, forking out less dough at the pump meant everyone suddenly wanted a diesel despite the fact that their running didn't justify the extra cost of buying one. However, the closing gap in prices of the two fuels is encouraging buyers to take a good look back at petrol powered cars. And let's face it, besides being more efficient and perhaps offering a stronger midrange (new age turbo petrols have that covered) diesels don't offer that much over a petrol. And they're noisier, vibeier and feel lumbering because they are heavier compared to petrols. What's also leading the revival of petrols, are new models. And one of the more significant new models has to be the Honda Amaze. It was our pick among entry-level diesel sedans where it comprehensively beat the popular Swift Dzire. But what about good ol' gasoline power? 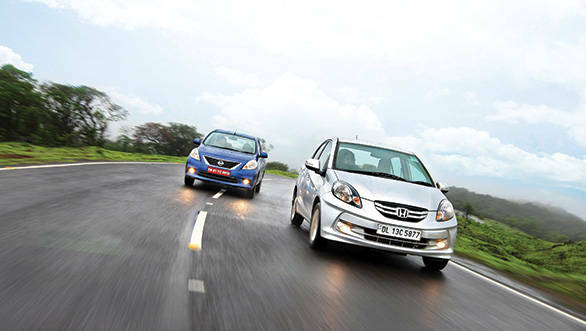 To find out we have the Nissan Sunny and the Toyota Etios joining the Honda Amaze in a petrol showdown. 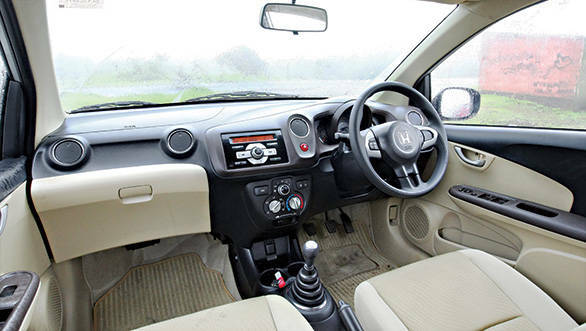 The Honda Amaze is a well engineered car offering space, good looks and practicality while still staying under 4m. The Toyota Etios is your standard entry level midsize sedan that offers the prerequisite space and practicality expected from the segment. The Nissan Sunny is at the opposite end of the size spectrum and offers ridiculous amounts of rear knee room for similar money. Honda deserves a real pat on the back for the Amaze. Hatchbacks with boots attached can look rather ungainly but not the Amaze. Its boot gels well with the rest of the Brio's design thanks to some smart character lines along the side profile and well designed City inspired tail lamps. However, the real accomplishment is the way they managed to liberate very generous space in the cabin and boot without crossing the 4m mark. We're talking City (read impressive) levels of rear knee room and a generous and usable 400-litre boot. A near flat floor only helps matter for seating three abreast. The Amaze is also just 15mm narrower than both the Toyota and Nissan which makes three at the rear quite comfortable. Simply excellent engineering. The interiors are typical Honda with big chunky knobs and dials on a dashboard that is built well but looks a little plasticky. My only dislike is the dark brown insert that looks out of place with the beige and black. The steering wheel feels great in the hands and comes with user friendly controls for the audio system. The sound system itself is the best of this lot and provides very decent audio quality from its front and rear speakers. The instrumentation offers two trips and a fuel efficiency indicator, besides the speedo and rev counter. But there's no real time fuel efficiency or distance-to-empty gauge. 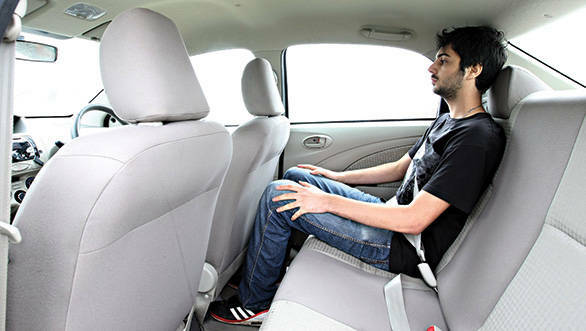 Fixed headrest seats are carried over from the Brio and are comfortable as is the driving position. We're still not fans of the centrally placed instrument console but what we do like is the flat bottom steering wheel. 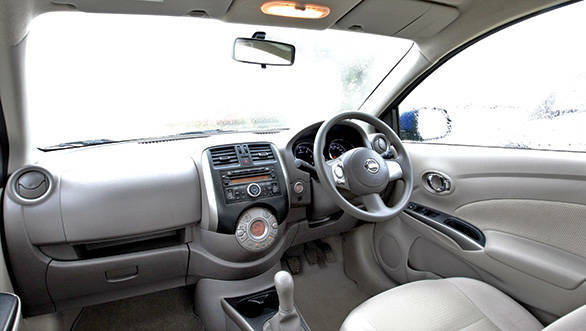 Indians associate beige interiors with premium quality and the latest Etios has adopted beige in an effort to rid its interiors of the 'cheap' tag. There's plenty of beige plastic and upholstery while the red accents on the seats and gearknob from the previous model are gone. The effect is a mature and less offensive looking design. Good points include the cooled glove box, spacious rear bench and cavernous 595-litre boot. The new seats with movable head rests are just as comfortable as the old fixed ones while the rear is still comfortable and spacious for three abreast. The new 2-DIN head unit looks good but like we've said before the sound quality isn't very good thanks to the four (front only) tinny speakers. The centre mounted instrument cluster has a speedometer and rev counter but the trip computer only offers two trips with no information on fuel range or economy. 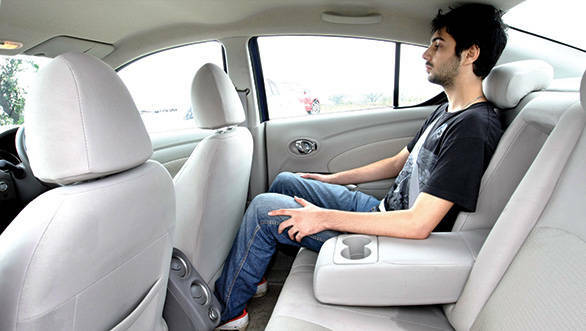 The other two offer electrically adjustable (and foldable) ORVMs as compared to the Etios' manual adjustability. 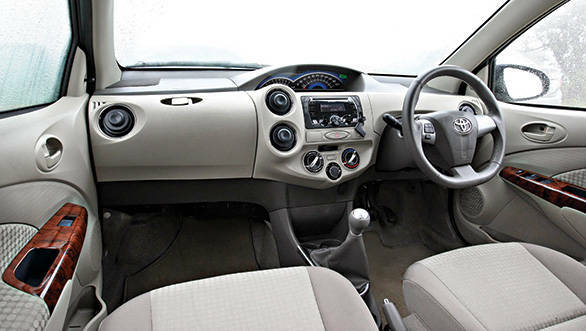 Overall the Etios interiors are much more palatable now, but remain at the bottom of the list in this company. The exteriors are nearly untouched save for the new grille and mirrors and continue to be sober and vanilla at best. overweight. The Sunny makes no attempt to hide the fact that it is a generously proportioned car. All three engines here are familiar units. The little Honda 1.2-litre engine maybe the smallest but it's our favourite of the lot. 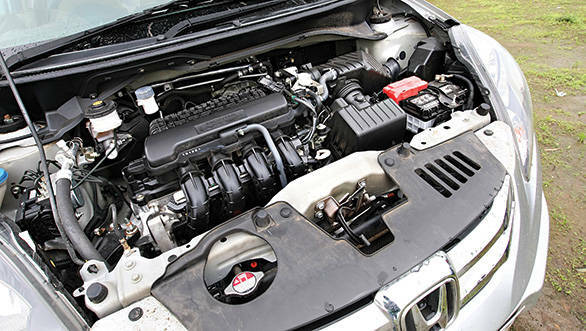 This engine made its debut in the Jazz and makes 88PS of power at 6,000rpm and 109Nm of torque at 4,500rpm. A time of 12.54s to 100kmph makes the Amaze the quickest accelerating car here by a smidgeon while top speed is limited to 140kmph (we hit 143kmph). 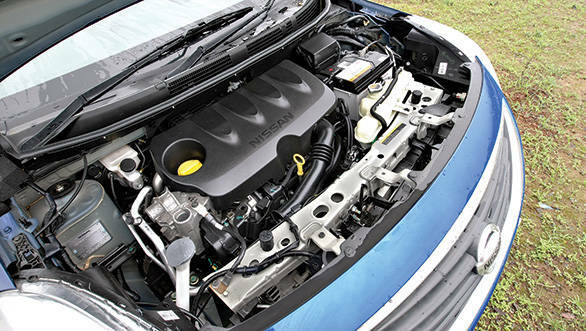 The engine feels refined, energetic and loves to rev but is also very drivable at town speeds. A slick five speed gearbox and a light, progressive clutch make the Amaze a pleasure to drive both in city and on the highway. Oh and it's also the most efficient motor here with a commendable overall figure of 15.9kmpl, despite the fact that at 965kg the Amaze is 20kg heavier than the Etios. The only gripe we had with the Amaze's drivetrain was its tendency to over-rev when you clutch in under hard acceleration for the next gear. It's not harmful in anyway because the engine is out of gear but it can get a little irritating. 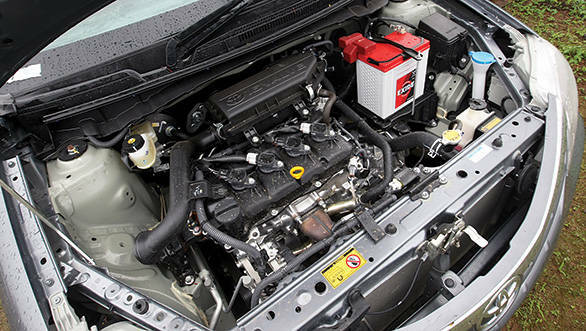 The Etios gives the Amaze a proper run for its money with its engine/gearbox combination. We've constantly gone on about how our favourite part of this Toyota is its drivetrain. The torquey but rev happy 1.5-litre unit produces 90PS at 5,600rpm and 132Nm at a low 3,000rpm. The dash to 100kmph almost mirrors the Amaze with a time of 12.56s while top speed lies at 175kmph. A larger capacity means the Etios isn't as efficient as the Amaze and it returns an overall figure of 14.5kmpl. Special mention should be made of the Etios' exhaust note  it sounds the sportiest at high revs but the engine cannot match the Amaze's for sheer refinement. The Sunny is the most powerful car on test here but it's also the heaviest. 99PS@6,000rpm and 134Nm@4,000rpm nonetheless are more than sufficient to haul the Sunny's 1,027kg kerb weight. However, it is still the slowest car to 100kmph (by a slim margin) with a time of 12.77 seconds. Top speed though is the same as the Etios. The Sunny's engine is smooth running but the gearbox is a letdown with poor, plasticky feeling shifts. It is also marginally less efficient than the Etios returning an overall economy figure of 14.2kmpl. What can be gleaned from this is that all three are closely matched in terms of performance while the Amaze edges ahead in terms of efficiency. All three of these cars are comfort oriented and none is going to set your pulse ablaze when you hit the hills. Nevertheless, the Amaze showed the best balance between ride and handling. It was the least prone to body roll and the light but quick steering weighed up well and offered decent amounts of feedback. The eager engine, slick transmission and good driving position make it quite the entertaining drive. It retains the nimble feel of the Brio which it is based on and has the same tendency to understeer when pushed hard. Ride quality is fair and the Amaze soaks up potholes well but it doesn't glide over bad roads quite as well as the Etios. The Amaze could also do with better noise insulation with road noise creeping in at speed. A tight turning radius makes the Honda easier to punt around in town. The Amaze's sharp brakes shed speed with the same confidence of its hatchback sibling and it came to a dead stop from 100kmph in 43m in our tests. Just like the other two cars here, rear knee room is ample. The Etios would have been the best handler here if it wasn't for the copious body roll. The Toyota grips surprisingly well but the sideways body movement can put people off. The steering also is a bit of a letdown both in terms of feel and because there are too many turns lock to lock. The Etios seats the driver comfortably but tall drivers will find the steering wheel sits too low even on its highest setting. Low speed ride has always been an Etios strong point but the car has poor noise deadening and road noise gets quite loud post 100kmph. Braking performance on the Etios is good with a sharp and progressive feel and the car comes to a standstill from 100kmph in 43.9m. Nothing at the price point matches the Sunny when it comes to rear passenger room. Also the only car with rear ac vents. 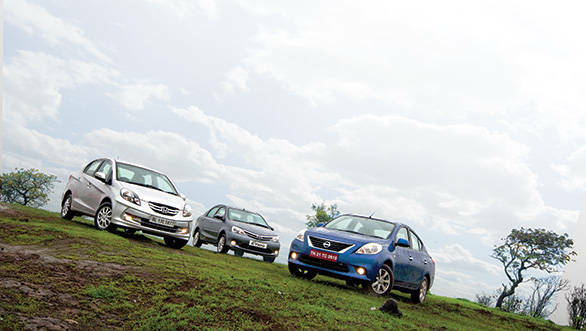 While the Amaze and Etios are reasonably entertaining driver's cars the Sunny is far from it. The car rolls the most and also displays the most nose dive under braking. The brakes themselves feel soggy and the performance shows it with the Sunny taking 4m more than the Amaze to come to standstill under hard braking from 100kmph. Low speed ride leaves nothing to complain about and it's also the most comfortable high speed car given the roads are reasonably straight and smooth. However, the lethargic body control and poor gearbox make the Sunny the least enjoyable car from a driver's point of view. It also has a large turning radius of 5.3m compared with the Etios' 4.9m and Amaze's 4.5m which means more reversing when making those tight u-turns. They say a car should drive like it looks and the Sunny does exactly that. That being said the rear passengers will be unequivocally pleased with the comfort the Sunny has to offer. Let's start with the Etios and the Sunny. If you're someone who doesn't like driving then close your eyes, buy the Sunny and hire a chauffeur. 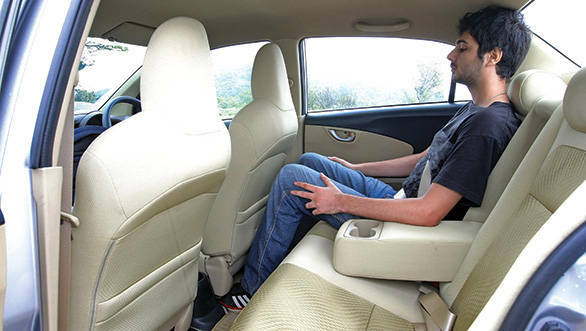 Its ride quality, space and features like rear ac vents make it the undisputed rear seat king in this segment. Yes the top end XV is pricey at Rs 9.8 lakh (all prices on road Mumbai) but the lower XL variant still gives you important features like ABS, airbags and the rear ac vents for considerably less money. If you're willing to let go of features like the push button start, alloy wheels, some chrome garnishing and electrically foldable mirrors the Sunny XL makes good value at Rs 8.8 lakh. 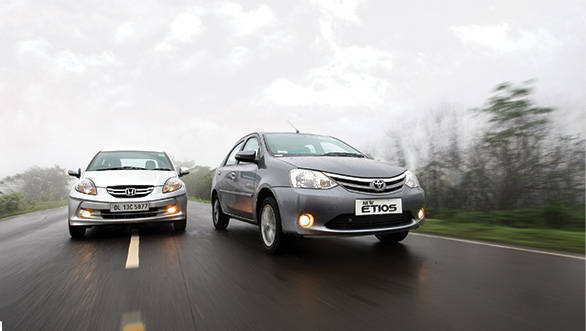 However none of our readers hate driving which is why the Etios comes in second place. It has all the fundamentals in the right place. It is a car with strong mechanicals, is spacious, practical and is decent to drive. Sadly, that's where it ends  the Etios is acceptable at best and there's no feel good factor surrounding this Toyota. It doesn't look very inspiring and the interiors and feature set will never remind you that you've forked out Rs 8.6 lakh for it. It gets the job done, but that's about it. The Amaze however does a fantastic job of proving that small is good. It's the smallest car here but it is far from cramped. It has the smallest engine here but is a brisk performer and also the most efficient. But best of all  it's the cheapest car here at Rs 8.2 lakh and the best value. It looks good, feels good and offers you a great feature set. Factor in that it's a Honda with a long waiting period and you can be assured that it's going to be reliable and hold a great resale value. It's also good to drive, by the way. Our winner?